“I learned the difference between saving and spending and between debit and credit!” said Aaliyah Nathan, 14, who, wearing black suede boots to the performance, admitted a weakness for new shoes. 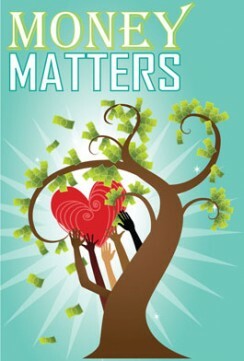 “Money Matters’ ” gritty realism came out in the personal financial stories of community residents and businesses. The play progressed from scraps of financial information to a complex weave of issues, such as U.S. consumerism and the impact of money on relationships. Netland, for example, was “inspired” by a vignette about a homeless man. To prepare for their interviews, the teens took four financial literacy classes conducted by Cambridge Savings Bank, which funded the play. Vincent E. Siders of Youth Underground directed, and Cambridge Savings senior vice president Susan Lapierre brought the idea for a play about money to the community organization. * “Money Matters” cast: Photo 1 (left to right): Shakeem Nicholson, Federico Roitman, Iris Smith-d’Agincourt, Trinidad Ramkissoon, Gabrielle Joella. Photo 2: Iris Smith-d’Agincourt. Photo 3: Sasha Forbath, Naomi Zahler, Sole Nazaire, Trinidad Ramkissoon, Shakeem Nicholson, Qalani Aimes, Robyn Bryan, Grace Henderson. Actors not shown: Juan Arevalo, Melissa Belance, Rosa Munson-Blatt. How could one see the play electronically? I’m working on finding out for you! Also, the play will be touring. Please stay tuned.